Sometimes it takes a stranger to see you as you really are.Born and raised on sprawling Texas land, Margaret O'Brien prides herself on her competence as a rancher. But her father believes she's made for more than just dawn-to-dusk work. He wants her to have the love of a good man, to raise children, to build a life. But Margaret gave up such dreams years ago. She's convinced no man would have her, that the ranch is her life now.So when Margaret's father hires Daniel Cutler as a new foreman, she's frustrated and suspicious. Then an overheard conversation links him with a gang of bank robbers, and she's downright worried. Daniel swears he's not involved, but Margaret's not convinced. She knows the man still has secrets. But would a criminal be so kind and talk so convincingly of his faith? As a series of tragic "accidents" threatens all she holds dear, Margaret must decide what to trust: her own ears, her best judgment ... or what her heart keeps telling her.From the author of the bestselling Blue Moon Promise ... an exciting tale of danger, romance, and faith played out under Texas stars. 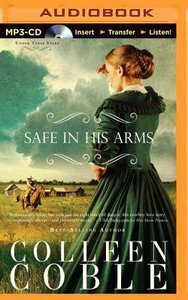 About "Safe in His Arms (Unabridged, MP3) (#02 in Under Texas Stars Audio Series)"
Customer Reviews For "Safe in His Arms (Unabridged, MP3) (#02 in Under Texas Stars Audio Series)"